Review by AllTheBestFights.com: 2017-03-18, good performance by both boxers: Gennady Golovkin vs Daniel Jacobs gets three stars. The undefeated Wbc, Wba, Ibf and Ibo champion Gennady Golovkin entered this fight with a perfect boxing record of 36-0-0 (33 KOs=92%) and he is ranked as the No.1 middleweight in the world. GGG fought twice last year winning over Dominic Wade (=Golovkin vs Wade) and Kell Brook (4-stars fight, Golovkin vs Brook). His opponent, Daniel Jacobs, has an official record of 32-1-0 (29 KOs=91%) and he entered as the No.2 in the same weight class. ‘Miracle Man’ (since he was diagnosed with osteosarcoma – form of bone cancer – in 2011, but he returned to the ring after spending 19 months out of the sport) suffered his only loss when he faced Dmitry Pirog in 2010, since then he has won 12 consecutive bouts beating Sergio Mora in his last one (=Jacobs vs Mora 2). 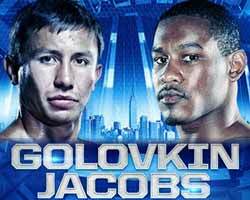 Gennady Golovkin vs Daniel Jacobs is valid for the WBA, WBC, IBF and IBO World middleweight titles (all held by Golovkin). Watch the video and rate this fight!